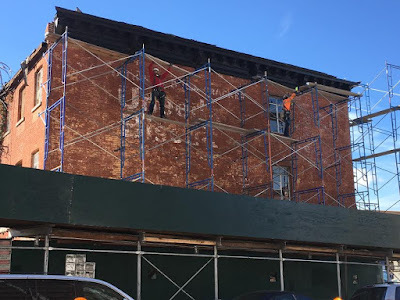 A reader just let me know that long-expected demolition work at 541-555 Fourth Avenue - eight low-rise, three-family apartment buildings - is underway. A high-rise rental building, with no inclusionary housing units, will replace the smaller structures. 541-55 were acquired by Anshel Friedman & Ariel Karpan in 2014/15 for $16.5M, and flipped a year later to Slate/Adam America for $26.5M. For more on the sales & development history, & Slate/Adam America's other developments/acquisitions nearby, follow the links back starting here and ending here. All too many! and here's the scene yesterday, when I walked by to take a look. It was lunchtime when I stopped by, and workers were queuing to buy lunch from a woman with a shopping cart across the street, where another Slate/Adam America building has had a partial SWO in place since April.